Save your thumbs! 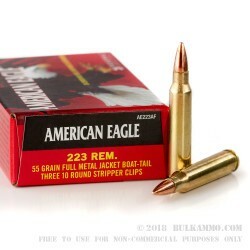 This .223 Remington ammo from Federal comes loaded on convenient stripper clips for easy magazine loading. Each box contains 30 rounds on three 10-round stripper clips. 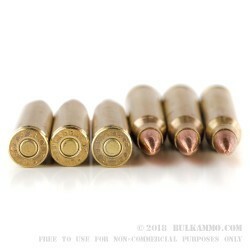 The ammo uses Boxer-primed reloadable brass cases. The stripper clips work with most AR magazines including USGI and PMAGs. The 55-grain, boat-tailed FMJ bullets are ideal for range use and will deliver the consistent groupings Federal ammo is known for. 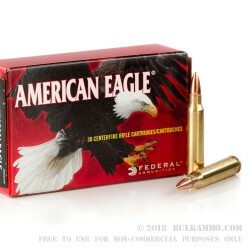 In business since 1922, Federal Premium Ammunition produces ammo for self-defense, range use, and military applications. The company operates two facilities, its own factory in Anoka, Minnesota and the US government Lake City arsenal in Independence, Missouri. Federal is a subsidiary of defense conglomerate Alliant Techsystems. Q: Does this ammo come with the "spoon" or "feeder" use to load the stripper clips into the magazines? A: This ammo does not come with the Loading adapter. Those are available in the ammo cans of 420 rounds.